Megan Bowen lives in Brisbane, Queensland with her husband, young daughter and their very deaf Cavalier King Charles Spaniel. She enjoys an outdoor lifestyle with her family and they can often be found making the most of Queensland’s climate with long walks in the evening and picnics at the beach or local park on weekends. Previously, Megan studied Law at University of Technology Queensland, but these days she spends her time as a full-time mum. As a proud Brisbanite, Megan is a passionate supporter of the Brisbane Broncos football team and can be found at every game come rain, hail or shine cheering them on from the sidelines. She helps her husband run a tiling business from home and they share a love of renovating, which keeps them very busy. Megan has always had a love for reading and writing, and spends her rare downtime writing poetry and short stories. 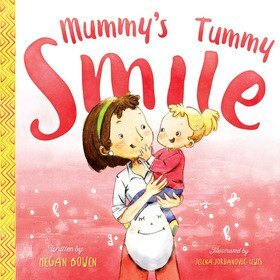 The idea for Mummy’s Tummy Smile came about when she gave birth to her daughter in January 2015 via Caesarean section, and quickly found that there were no books that could explain to her curious toddler just how she had come to be. This then became a story that Megan wanted to share with fellow C-section mums and their children to explain the link between our little ones and our beautiful tummy smiles.